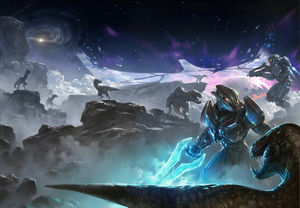 A human-Sangheili force encountering chaefka during Operation: FAR STORM. At 0900 hours, Dr. Luther Mann discovers a timer on Installation 07 evidently counting down to the Halo's activation in five weeks. Similar countdowns are reported on the other intact Halos. It is deduced that the activation could only have been triggered from Installation 00. 000 Tragic Solitude questions about the Forerunners' choice of the humans being their successors, and the galaxy repeating the same cycle over and over again, deciding to return the Installation 00 to its former glory, whatever the cost to the other races of the galaxy. In response to the activation timer on Installation 07 being activated, Operation: FAR STORM begins with a joint human-Sangheili force is sent to the Ark on a covert operation to stop the activation sequence. Operation: FAR STORM is completed with the deactivation of Halo's priming sequence and the destructon of 000 Tragic Solitude. The Office of Naval Intelligence discovers about Atriox's origins after interrogating a Sangheili prisoner. Huragok Quick to Adjust and his human handler Sadie Endesha are captured by United Rebel Front soldiers on Talitsa. A team of Spartan-IVs is sent to rescue them and ultimately succeeds in their mission. Spartan Michael Crespo is detained by Spartans Buck and Agu following the former's defection to the URF. The Type-55 storm rifle is catalogued by the UNSC. Auriga Station is commissioned by Lethbridge Industrial. The M6H magnum is adopted as the UNSC's primary sidearm. Tomas Navarro enters UNSC service. Hannibal Weapon Systems takes over production of the MJOLNIR Rogue variant. Installation 07 is discovered by Dr. Luther Mann from data found on Trevelyan. An ONI research detachment, including Dr. Mann, is subsequently dispatched to study the installation. Lieutenant Commander Jameson Locke's special operations team arrives at Misriah Armory at Eos Chasma on Mars. Locke reviews ONI Eyes files procured from Sedra. Late in the year an automated UNSC scout vehicle, Recon-14, begins transmitting from Alpha Shard, piquing the interests of the Office of Naval Intelligence. The probe continues to document the surface of the ring's fragment, reporting all noted anomalies to ONI. These transmissions are analyzed by several ONI specialists, including Doctor Madeline Tress. Recon-14 detects a group of Thanolekgolo eels below the shard's surface. When the probe ventures to investigate the eels, the abnormally aggressive Lekgolo attack it. The heavily damaged Recon-14 succeeds in transmitting its final recordings to ONI before being destroyed by the Thanolekgolo. ONI stops manufacturing the Z-4190 bubble shield, refocusing its shield research efforts towards Mjolnir-compatible emitters. Operation: FOCUS LENS 2555, a simulated second Covenant invasion of the Sol system and a joint service exercise between the UNSC Army and another branch of the UNSC Armed Forces, is conducted on Mars.